EDIT: Giveaway is officially closed. Congratulations to the randomly chosen 278th commenter, Irene! Preen your feathers, girls - this peacock ore necklace will give itself freely to only one of you. 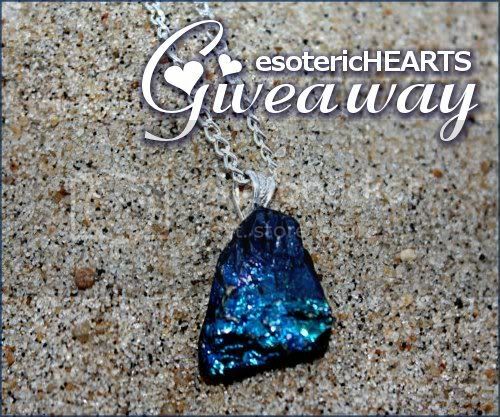 Jessica of esoteric HEARTS chose this incredibly iridescent blue pendant as a prize. The photograph doesn't show nearly as many shimmering shades as the stone actually possesses - the colors change constantly in sunlight. Jessica describes rainbow peacock ore as one of the most beautiful stones she's ever seen. She's attached the stone to a silver plated bail, strung from a 20 inch silver plated chain with a lobster claw clasp. You may recognize the simply unique quality that the esoteric HEARTS piece exudes from my handmade trove - I was lucky enough to win a druzy geode necklace last month. Now I'm prancing about proudly because I get to host a jewelry giveaway for the designer. Jessica is a 21 year old college student studying lighting and sound technology with the dream to one day be a lighting designer for a famous rock band - how fun does that sound?! She crafts jewelry for herself in her spare time and has received so many compliments that she began selling her designs exclusively on Etsy last June. Giveaway is open worldwide. I will be pulling a number from my random.org top hat after 11:59pm EST on January 25, 2012, and the corresponding commenter will win! Jessica will contact that lucky soul for a mailing address. If she doesn't hear back from the winner within 3 days, a new number will be drawn. Mandatory Entry: Swoon by the esoteric HEARTS Etsy shop then comment on this post with your favorite handmade item and a way to contact you, preferably an email or Etsy shop. 1. Like that same item by using the facebook like button on the right sidebar of Jessica's Etsy listing and leave a comment here with the number of likes to the right of the button OR share it on your business page and include the link when commenting. 3. Buy anything from her Etsy shop. Use coupon code ESOTERIC12 to receive 15% off. Leave a separate comment for every $5 spent. 5. Follow BOTH @esoteric_hearts and @aquariann on twitter. Leave a separate comment with your own username. I absolutely love the Volcano Cosmic Ring Swarovski Crystal Two Way Circle Sterling Silver Necklace! I added the item and her shop to my favorites! i love the Raw Lapis Chunk Necklace! I liked the Silver Birdcage Necklace. It has 1 Like. Added to my favorites on Technorati (However the sites currently does not display favorites). my favorite is teh raw citrine druzy silver dipped pendant! beautiful! I love the Volcano Cosmic Ring Swarovski Crystal Two Way Circle Sterling Silver Necklace. I liked the necklace. I'm the first to like it. i like the peacock ore necklace!!! Natural Citrine Silver Dipped Circle Necklace is my pick from the shop. although the starfish barrettes are lovely too. My favorite piece is Silver Brazilian Amethyst Druzy Dipped Necklace - I liked it on facebook as well. Love the Silver Birdcage Necklace!! I like the Silver Brazilian Amethyst necklace. I like the jar of hearts necklace! I hearted an item from her shop and favorited her shop on Etsy as kimberly. I love the Mermaid Tears necklace. Fave item is Silver Brazilian Amethyst Druzy Dipped Necklace. I like Swarovski Aurora Borealis Sterling Silver Earrings. The silver birdcage necklace is pretty! My favorite is the Blowin' In The Wind Harmonica Necklace. The peacock ore is actually my favorite! Citrine is my birthstone, so I'm loving the Natural Citrine Silver Dipped Circle Necklace! The Sakura bobby pins are marvelous, too! Christina - xristya@rock.com - I love the Silver Birdcage Necklace! youreadiamond is my etsy username! youreadiamond is my etsy username! Liked & hearted her shop/an item. I am absolutely in love with the Raw Citrine Druzy Silver Dipped Necklace! Voted for you on picket fences today 12/01. Thanks for the giveaway! This pendant is beautiful! I LOVE the Silver Brazilian Amethyst Druzy Dipped Necklace - I just adore Amethyst! Liked via the facebook button too! To be perfectly honest that beautiful druzy at the top is my favorite but i also like the Natural Citrine Silver Dipped Circle Necklace!! I hit the Google +1 button! I love the Black Swarovski Crystal Sterling Silver Necklace. I'm in love with this Natural Citrine Silver Dipped Circle Necklace! I hearted my fav item which is the birdcage necklace and added shop to my favs. liked giveaway on my facebook. I really like the peacock pendants, they're so beautiful! I had already 'favorited' the shop and have now hearted the item. I liked this on Facebook, too. Voted for your blog via Picket Fence Blogs! I love the Silver Brazilian Amethyst Druzy Dipped Necklace! I liked on FB - Kitty Cartouche. Thank you! I'm a follower on Twitter as @antispamgirl. Thank you! I tweeted: https://twitter.com/#!/antispamgirl/statuses/158013608087912448 . Thank you! Voted for you on picket fences today 13/01. Like the item on Facebook. It now has 4 likes. Like the silver birdcage necklace. I absolutely love the Golden Egg Locket Necklace! What a cute little website! Thanks for holding the contest! I like the Volcano cosmic ring necklace! The volcano cosmic ring necklace is just lovely. Thanks for the chance to win. I like Black Dangle Swarovski Sterling Silver Necklace (1 like) on FB! I Like this giveaway on facebook by using the like button at the bottom of this post!